Heart hammering, lungs burning, arms and legs like lead, blinded by the sweat dripping into your eyes. This is a situation every rower will commonly find themselves in whilst training. However, none of this is as limiting as the thoughts running through your head. Whether on the ergo or out on the open water, we push ourselves to our limits; striving to get stronger, faster and more powerful. However, our minds are the drivers of our finely tuned engines and we must work to control our thoughts, block out the pain and convince ourselves that the hurt we are feeling is good, healthy and helpful. The first thing is to acknowledge that the pain will come, but not to be afraid of it. You must acknowledge it, welcome it and understand that pain is a signal that we are pushing our bodies to grow stronger and go faster for longer. Goal setting is a really important aspect of sport and training for a variety of reasons. The simplest reason is that goals are what motivate us. If we don’t want to achieve something, or aren’t clear about what it is we are trying to achieve, then we will be less motivated to participate in an activity and less able to push ourselves hard during that activity. Know what it is you want to achieve. 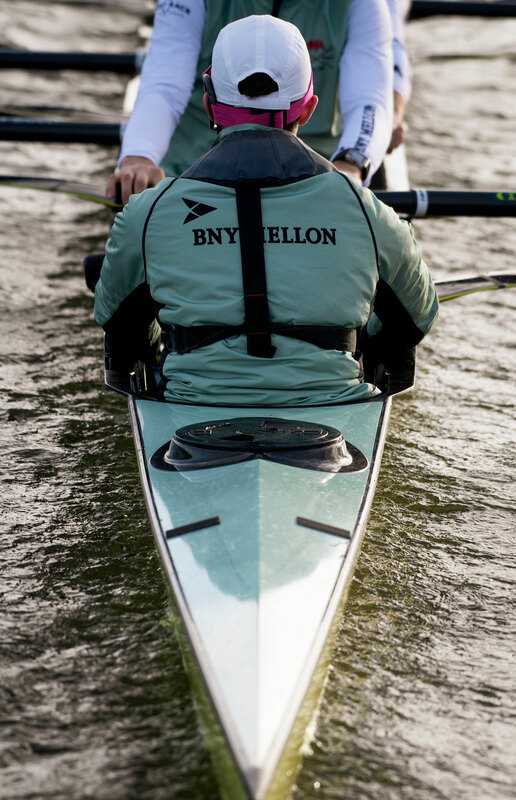 Why do you row? Is it for fitness? Is there a competition you’re targeting? You might be rowing for fun or fitness, but the chances are you’ll have something that you want to achieve in each session. Make sure you know what that is. A goal shouldn’t be ‘I want to try my best’. It needs to be something that is tangible, clear and explicit so there is no doubt as to whether you have achieved it or not. For example, achieving a specific power output for the duration of the ergo session or completing a section of the river in a set time would be tangible and achievable goals. These goals need to get your heart racing when you think of them, to the point where you believe you can do it but you know you’ll have to work to achieve it. Once you’re clear about what it is you are trying to achieve, both overall and within each session, focus on these goals when you feel the pinch and remind yourself of why you are pushing so hard. Often, it is only after the session that we remember why we wanted to work so hard and sometimes we then regret that we didn’t push through. If you’ve got a long set of repeats to complete or a long timed endurance session, don’t think too far ahead. Focus on the repetition that you’re currently on and work to get the most out of that one. During the rest period, think only about the next one. At obvious bench marks, such as halfway or with two or three to go, think about how far you’ve come and talk to yourself about how strong you feel and how well you’ve done so far. How we talk to ourselves is crucial to how we drive our bodies. The running commentary we have in our heads is perfectly normal, but the key messages, tone and attitude of that commentary are critical to determining how upbeat we feel about ourselves and the task at hand. I’m sure we’ve all been victim to the serial moaner in a training group; you know the one, the person who’s never happy, always complaining and always talking about how tired and sore they are. Think about how draining it is to be around that person and then think about how drained you will feel if that is how you talk to yourself in training. So, the key is really to be aware of how you talk to yourself first and foremost. After that, try to focus on more positive thoughts, such as using the goals you’ve set to block out those negative comments. Using positive quotes that you’ve heard and liked can be useful too, and many people find music can be useful for this purpose also. Finally, whilst all these positive approaches to the task at hand are proven to work, you may just need to switch off and think about something completely different. This may allow you to reach that training utopia, where you’ve broken through the pain barrier and it no longer hurts. Believe me, it does happen. As mentioned in the last comment, music can be a great distraction tool and many athletes use this successfully. If you are training outdoors, focusing on some thing abstract on the horizon may help you clear your mind. For others, focusing on the sound of your own breathing can be a useful way to distract yourself from any negative thoughts. These are a few of the key ways in which athletes deal with training pain. Whatever method you use, it’s important to acknowledge to yourself after each session how hard you’ve worked. This allows you to honestly reflect on any areas of improvement so as to ensure you leave training with a positive mind-set, ready to train hard and work on those improvements in the next session. Note. When referring to ‘pain’ within this article, the author is referring to pain related to the metabolic stress of the session, not pain related to injury. If athletes feel they are injured, they should not try to push through the pain and should stop and seek medical assistance.